Conflict resolution or conflict management is a skill, no doubt. Conflict is a normal occurrence, and it can sometimes be healthy for a relationship if it occurs once in a while. It is impossible for two individuals from different backgrounds to agree at all times. As a result, conflict in relationships is inevitable. Since they cannot be eliminated, it is only normal to learn how to manage them when they occur. Mismanagement of conflict can harm any human relationship, and such harm may leave indelible marks and irremovable scars. The reverse is the case when conflicts are managed in positive and respectful ways; it can turn the worst of enemies to the best of friends. There is no better way to create stronger bonds between two individuals than by managing their conflicts or disagreements professionally. Not everybody has the skills needed to manage conflict professionally. However, everyone can learn the skills. A Proper understanding of the techniques and skills involved in conflict management can help the individual and every person the individual associates with, in proper management of any conflicting situation that may come up. An individual well versed in conflict management will not only be able to manage conflicts involving other people but will also manage conflicts in his/her personal life. In this text, we will delve into the various fundamentals of conflict resolution. Several skills that can be adopted in conflict resolution will also be considered. 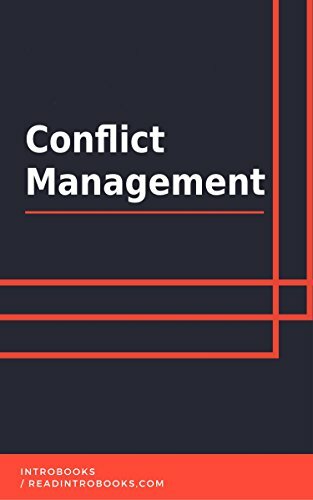 While the content may not transform the reader to a complete professional in conflict management, it promises to show the reader how to manage conflict effectively and set the foundation for a broader view regarding the technicalities involved in conflict management. With the foundation set by the content of this text, the reader can have a better understanding of the intricate issues relating to conflict management.